.. We watched these guys and gals sipping stuff in about 8" of water for 10 minutes. Must have been midges - we saw nothing. .. Sauntered back to the car, changed cameras, and rigged up. Returned and took one on a size 20, (all used up and ragged,) Hare's Ear: well greased and floated. Didn't get our sneakers or fanny wet. Returned to car and watched the wet fanny's for a time. .. 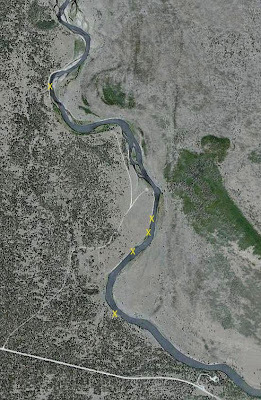 Most fishers were up to their fanny in the Firehole River yesterday. We suspect that it's cooler that way, but that's where the fish like it too. Hmmm. .. Caddis just starting, dead calm, wispy con trails, hoppers in the grass, no one on the water, just a few cars leaving the park, elk bugling in the distance, honkers sunning themselves, fish at the surface in mid day, AND two days until October. It can't get any better! .. The caddis are small, the hoppers are too. The fish are eating both: sticks, twigs, grass, ants, and other bits of flotsam as well. The little fish, (to 9",) are frenzied. The larger fish are lethargic and just nibbling away. Nosing around might be the way to put it. Don't be too anxious, the little ones will hook themselves, the bigger ones will tug the line and let you know. .. There are new beaches for the viewing and fishing. The low water levels from the Hebgen Dam breach have exposed beaches that are usually not available for fishing at this time of year. Depending on the rate of fill for the reservoir, this should be a boon for Fall fishers. .. The expansive beaches around the Happy Hour Bar are gaining much attention from some of our neighbors. Gulpers are still active and are especially hungry. Enormous pods of fish are cruising the inshore waters of Rainbow Point. .. These fish are wonderfully indiscriminate in their feeding habits. 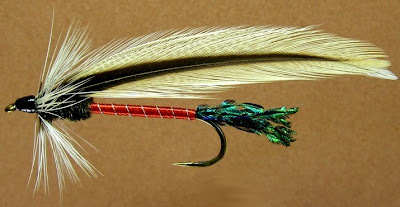 A double fly rig with a small soft hackle and floating nymph will bring quite a few fish to shore. .. Evening time, and through an hour after sunset are highly productive. Don't kick the lawn chairs or step in the worm cans. Build a fire just before dark and enjoy the stars. .. As the reservoir level stabilizes the parked spawners at the Madison River delta will begin a more vigorous ascent of the river. A bit of cool weather would surely help. .. There are also some nice Rainbows that have already made their way to the plunge pool at the base of Gibbon Falls. Swing a streamer in the cavitation eddy if you can cast that far. .. Remember to report tagged fish and avoid the area around the fish weir near Baker's Hole. .. This year's dry Fall weather has kept flows low in our rivers and streams. Fish are concentrated in dark water, beneath undercuts, and in the shade on our smaller tributaries. They are occasionally "joyously large," as one neighbor puts it. .. Cabin Creek, Duck Creek, Obsidian Creek, Indian Creek, Cougar Creek, and Grayling Creek are all fishing exceptionally well right now. Terrestrials and soft hackles, (sunken or floated,) will exercise your reel if not your backing. .. Indian Summer provides an exceptional time to avoid the rabid trophy fisher. A stroll along a small creek, with casts of 15' or less, probing the bushes and undercuts between shallow pools is a fine way to fish the neighborhood. .. The run is on -- but it's still a trickle. There's plenty of cold fog, mist, drizzle, rain, and snow in the coming weeks. That's the time for stories and trophies. .. It's time for breakfast: SOS, a quart of milk, and blueberry pancakes for desert. It'll take some fishing to get rid of that. just what good is the dam ? .. As water continues to gush from the breached head gate in Hebgen Dam we ponder some interesting topics that are not in the newspapers, or on television, or in the myriad blogs chattering about the story. .. If you've been asleep just Google-up Hebgen Dam in the news section. You'll be better informed than most. The last time this structure received so much publicity was in 1959 when an earthquake and mountain-slide caused water to back up the Madison River and threaten the dam. That event created Quake Lake. .. Thus we have incorporated into our vocabulary "Hebgen Lake." This insidious usage of the word lake conjures up images far different than does the word reservoir. The glories of recreation and beauty are seldom associated with a reservoir. There is method in their madness. We value lakes; we abide reservoirs. 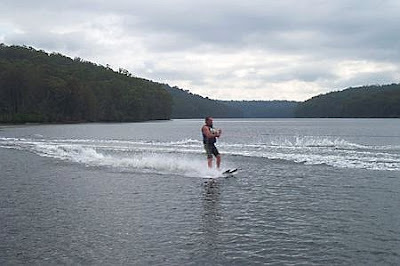 .. Real Estate Developers and Recreationists love lakes. Business thrives near lakes. Opportunities for wealth and success are enhanced by dams that build 'lakes' and provide economic stability and growth. .. Hebgen Dam impounds 278,562 acre feet of water in it's reservoir. It is 15 miles long on its southern end and over 4 miles wide at its widest point. Currently it is discharging 2,977.5 cfs of water that had been impounded. The Pool is 10 feet below capacity and the flood-surge control pool is 0.0% full. The reservoir provides no hydroelectric power, although several attempts have been made in the past to get a permit for doing so. .. The water front property is doing very well in a supposedly 'down market.' These opportunities are so new that their web pages are still under development. 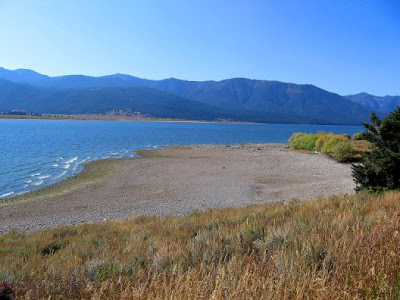 PPL Montana describes the reservoir as the premier still-water fishing lake in Montana. .. Fly fishers from across the globe come to fish the Madison River, both above and below the dam. A thriving industry depends on the dollars from these world traveling fly fishers. Feather merchants, tackle purveyors, guides, motels, restaurants, gas stations, trinket shops, photographers, outfitters, etc. all love Hebgen Dam. .. 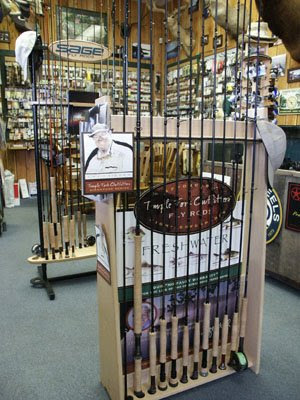 They love it because it keeps the fish downstream happy and catchable. 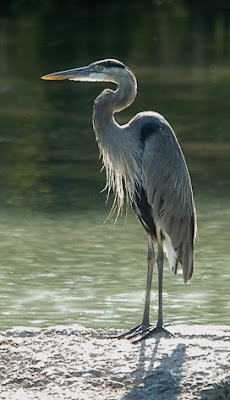 They love it because its reservoir holds large numbers of large fish that are easily caught. They love it because the reservoir allows fish to leave Yellowstone National Park - grow large - and then return to be caught. .. Thus it is that, while currently, all across the country conservationists, environmentalists, and fishers are allied in the call to remove dams; our local voices are screaming for this dam to be repaired. AND QUICKLY - Please: there's still a few good weeks of money to be made. .. Around our isolated little community the neighbors, (they are the ones that live in town year 'round - not in country mansions, or summer cabins on the lake,) have some interestingly progressive views about a dam that is approaching its 100th birthday. .. They definitely do see the Madison River as 'broken.' In fact many of our neighbors see this as the first step in a discussion about the need for the dam - at all. And maybe fixing the river. .. Hebgen Dam is not a substantial structure. It will disappear, (in the near or distant future.) The reservoir already has silt problems. It is becoming shallow and producing more toxic algal blooms by the decade. The artificially enhanced fishery within the reservoir is maintained by muck loving insects in the stagnant shallows. .. There is currently some discussion of the possibility of removing the dam, while we can, and while we see the problems it has. 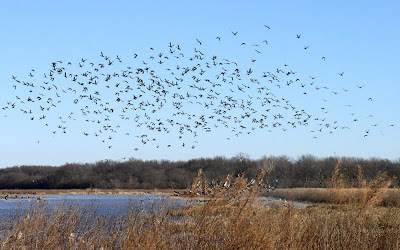 .. One of our neighbors, only half in jest, suggested that the Sierra Club, Trout Unlimited, The Buffalo Field Campaign, Ducks Unlimited, and Green Peace could form an alliance that would bring the dam down in a heartbeat. .. 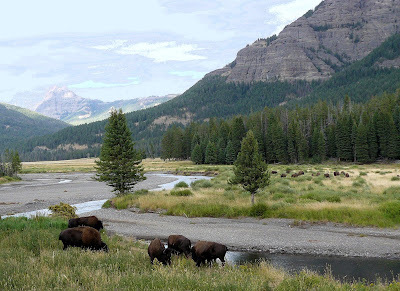 There would be forage for migrating bison, wet lands for waterfowl, a free-flowing river for trout, and a reclaimed habitat for all wild creatures, great and small. .. The real estate developers would not like it much, nor would the lake front property owners. And judging by the cry to save the dam, neither would the regional fishing industry. .. You won't see this discussed in the papers, or on the television, or the blogs. You won't see it given much credence in the musty aisles of feather merchants and tackle purveyors. Not many folks will give it much attention nor will they take it seriously. .. Not, that is, until we abandon the idea that the reservoir is a lake and that river regulation is the way we should behave toward a treasure that was once unencumbered by a dam and several industries. .. The lush Hebgen Basin was once a beautiful valley. The homestead maps show many names that are still among our neighbors. 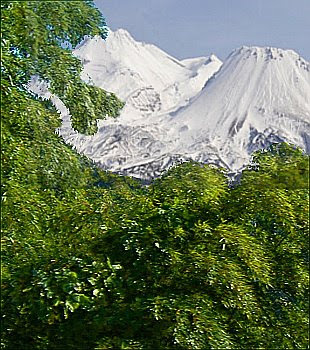 The cultural and social memory is vivid about the beauty of the valley. Perhaps the dam will stay for the moment, but this too shall pass. and then the 'broken' river will finally be fixed. 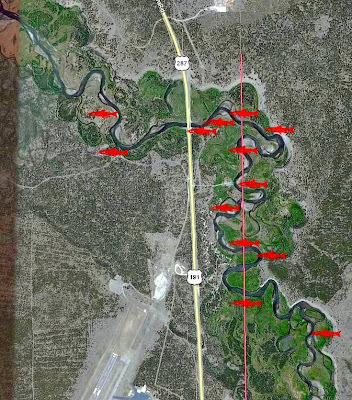 .. Then there will be about 20 more river miles of free flowing trout stream added to the Madison River. 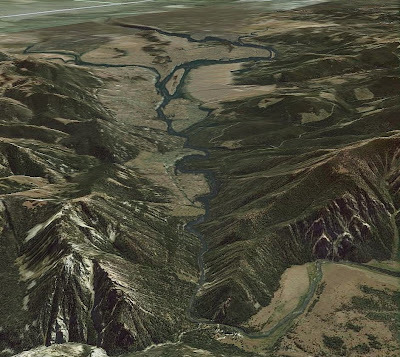 The South Fork of the Madison River will gain a couple of miles. Grayling Creek will not terminate in a bog. Duck Creek and Cougar Creek will be revitalized..
.. Have you been to Spring Creek? It's only about 200 yards long and its native cutthroat population is nearly extinct. .. Would that we would live so long: it would be a great fishery! .. A brief temperate spell has crept into Indian Summer and reminds us that the heavy weather of Fall is just around the corner. The neighbors are taking advantage of the salubrious weather and fishing between the localized heavy thundershowers and snow and hail storms. They have rushed to the mucky, muddy, sloggy, and sloppy Madison River delta for a bonanza of pre-spawn fish. .. 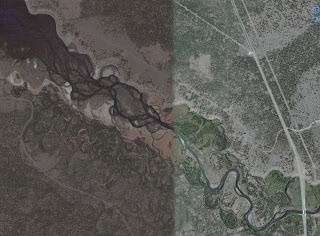 The braided distributary channels of the Madison River delta are becoming incised and clearly defined as the hole in Hebgen Dam continues to lower the reservoir level by six or eight inches per day. The Madison's channel of debauch has narrowed considerably in the last 48 hours and the fish are clustered, confused, desperate and very skittish -- OH; and BIG too. .. Take a long and heavy rod into the suction pit that is the delta. A 10' nine-weight is about right. Toss half a chicken into the current and let it swing into the dark holes. .. At the end of the swing triggle it just a bit and then back strip about 6' of line. Tighten and hold on as the fly comes to the surface. You'd best have an obscenely thick and strong leader - even the worm guys are getting broken off. .. A couple of the more energetic neighbors have take their Spey rods out of the closet a month early and are using this opportunity to warm up for steelhead. .. As far as the weather goes: it goes. The 15 day outlook is for a most gentle slide downward as this Fall is looking warmer and milder than some Summers in recent memory. .. Hints of our normal fall weather have come in the form of blinding hail, cold gusty winds, a few snow flakes and then ameliorating conditions. We'll take it. .. We'd be remiss if we failed to note that THE HORSE'S MOUTH has brought forth a bit of gentle beauty on their most recent page entitled Beach Beauties - look it over for some interesting features. 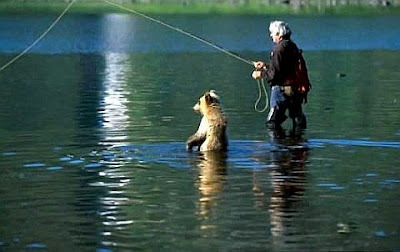 We're also fond of the cute bear picture from Fish On Fridays. Wonder where 'mom' is? .. Well, it's raining right now and the gray sky suggests that after some cold pizza and a beer, a bit of fish catching might be in order. Happily mud is not yet a four letter word. .. 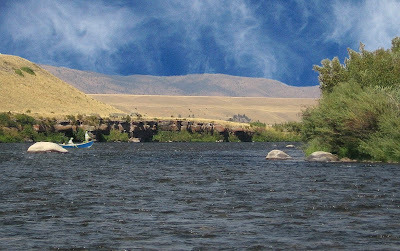 If Patagonia is not on your agenda then fish the Madison River delta at Hebgen Lake. The warm days have only slowed the run a little and the incised channels of the delta are holding pods of very wary large fish. The fish are holding longer in the delta this year. 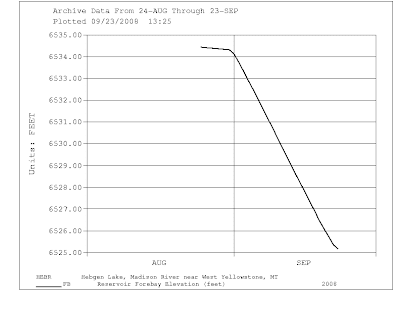 This may be due to the down-cutting of the channels from the lowered lake level due to the breach in Hebgen Dam. .. At times, (if you're sneaky enough,) you can see what appears to be a writhing river bottom -- the trout are so thick that the stream bed seems to be animated. Fin to fin, the fish stack up. They seem confused and bewildered. They are spooky, large, spooky, animated, spooky, and determined to move up river. .. Neighbors with worms are catching a few. Neighbors with San Juan Worms are taking some. They are only whispering about the rare occurrence. We'll be saying no more. .. 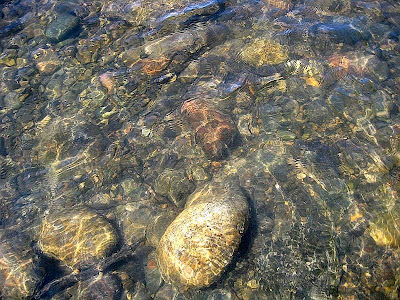 Please be advised that much of the best holding water for lake-run fall spawners on the Madison River straddles the park boundary. A step in either direction can mean that you need a Montana Fishing License or a Yellowstone Park Fishing Permit. 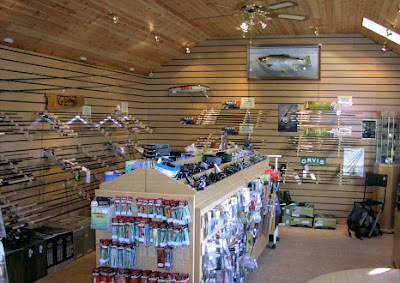 Be sure you have both if you intend to fish between the Barns Holes and Baker's Hole. .. The warm days have not slowed the run. 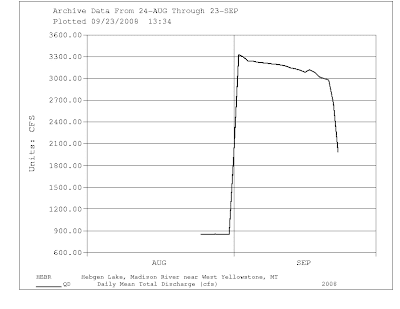 In fact it appears to be accelerating due to the Hebgen Dam breach. .. We've been sworn to secrecy for a period of 48 hours -- however we can say that the delta is fishing better than in recent memory. DETAILS IN 48! .. Fish the banks for some surprising results on the Madison River in Yellowstone National Park. Streamers on the large side seem to be the fly of choice. .. All the dark water is holding fish right now: big ones, little ones, giant ones and dinks. 'NUFF SAID. .. P.S. Walk a bit upstream from the first parking area. Or, downstream from the second parking area. .. P.P.S. Heightened lateral line awareness is part of spawning behavior. .. Be the first on your block to own the ASUS bamboo computer. You must pre-order now. .. We suspect that one of these will find it's way to The Bamboo Forest Near Mt. Shasta. .. The malfunction of two hydraulic gates at Hebgen Dam caused a bit of surprise and curtailed fishing on the Madison River Monday. 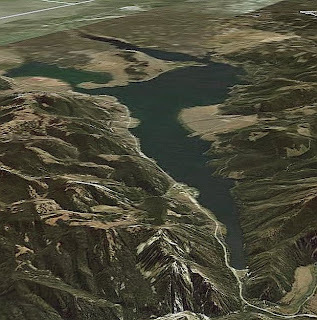 The waters of Hebgen Reservoir rushed through the gates and scoured the channel between Quake Lake and Hebgen Reservoir. .. The fishing "Between the Lakes," has been closed and conditions are certainly different downstream. Check with local fly shops in West Yellowstone, Ennis, and Bozeman for conditions and fishing opportunities. Check these news stories for a bit more information: MONTANA'S NEWS STATION.com and KPVI.com. be sure to check with your local fly shops before you plan anything in the next few days. .. The fishing on the Madison River has been exceptional this year and, despite a few recent snow flakes in West Yellowstone, the cooler temperatures had suggested that fishing would continue to be very good for the Autumn. .. Certainly things will be a bit different from this last long weekend when perfection was the name of the river. .. It has been quite some time since we fished on the Madison River in a drift boat. It's a pleasure generally reserved for hunters of large fish, visitors with a bit of extra cash, neighbors with boats, and guides on their day off. .. However, this past weekend, one of our neighbors, who is a guide, took a day off, and gifted us with a driftsman's holiday. .. The day was surprisingly perfect. The winds were well below gale force. The sun was occasionally obscured by a wayward cloud. The hoppers were on the water. The fish were on the bite. The traffic was amazingly light for a busy weekend. And; the company was exceptional. .. 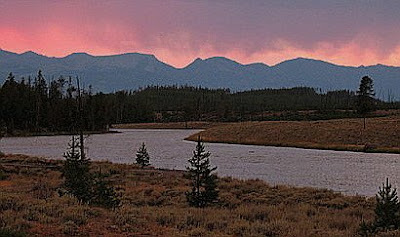 The Madison River offers fisher folks an opportunity to catch fish in a delightfully pastoral setting. The valley is picturesque and the access is excellent. The experience from a boat is interrupted by fishing and catching - only if you want it to be. A gentle float down the river without any fish would be just fine. .. Autumn was only a hint in the air. Crisp zephyrs came to us and wafted downstream, (perfect for casting.) Berries had some color and the gloss has gone from the leaves on the stream-side vegetation. .. There are places to park and enjoy the river and it's inhabitants. Half a sandwich serves for a late morning snack and watching a few other boats drifting along aids digestion. .. Try a BIG HOPPER with a little hopper dropper for a chance at some of the bigger fish in the river. We were treated to some splashy aerial acrobatics, quite a few dinks, some decent fish and, of course the big ones that got away. 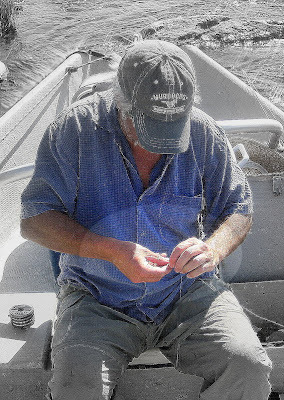 .. One thing that should be apparent to fishers of the drifting sort: "Never hire a guide with skinny arms." .. With some good luck and a bit of planning you can get one with a few thousand days on the river. .. 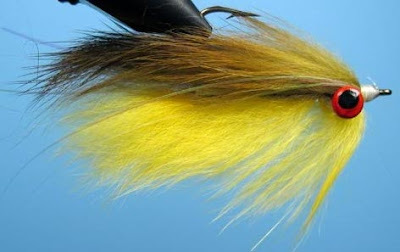 If you get a true master your flies will be rigged, and you will not need to cast too often. The guide will maintain your drift and even place your fly over fish without you having to do anything but catch it when it rises. .. If you're even a bit more fortunate, your neighbors will take you fishing and do all the work while you have all the fun. We're fortunate that way.